It’s been six months since I got the keys, and things are coming together. Not always the way I imagined in my mind, but that’s okay – it’s still great. For instance: I’ve only had one major mechanical failure, and the basement stayed mostly dry during last week’s record-breaking rain. I have just three more rooms to paint, and there’s functional furniture in all the necessary places. I finally have the DVD player hooked up to the TV. Maybe someday I’ll even get an antenna. But overall, it’s home. And it’s amazing. Thanks to all of you who have lent a hand in helping me over the last six months. Truly, I couldn’t have done it without you. I was all settled, tucked into bed. But the music wouldn’t stop. Trumpets, trombones… I could even hear a tuba. Not too loud, but loud enough that it kept waking me up every time I started to fall asleep. Nothing to see out my window. Sigh. Back to bed. Louder, now. Can’t sleep. Slippers on, alarm off. Out the front door — following the music. Down the block and across the street: a brass band. People dancing quietly in the street. This is no party, that is obvious. But something. It takes her a few moments to comprehend my blank stare. I’m sorry, I don’t know. I work out of town; I’m not home much. What happened? Oh. I only get the Strib on Sundays. Which explains the subdued but emotion-filled music. The long trombone solos and the eerie melodies. I understand, now. “I’m new to the neighborhood,” I explain, “but I heard the trumpets, and I followed them here.” She tells me all about the group, and about the accident. He had the right of way, but the other car never stopped. I saw the wreckage this morning on the way to work without realizing its significance — a brick sign and garden planter for a neighborhood church, smashed to pieces. It caught my eye, and I remember thinking “if they haven’t seen it yet, someone is about to have a bad day.” But I didn’t know it involved a neighbor. The music and dancing went on for a while. Not raucous dancing. More just swaying and holding hands. Dancing for comfort. I walked home when the music ended, thinking about what it means that a group of neighbors spent their evening dancing in the street in honor of one of their own. I think I’m lucky to live here. It’s a tiny – and strange – office, that’s true. Awkwardly shaped. Has a wall with three doors leading to the same storage area. Unpainted floor and orange-yellow walls. And now, it has some new shelves. Instead of a filing cabinet, I chose an IKEA shelf that holds five filing boxes. And for general storage, this fun bookshelf. They fill the wall leading into the office from the basement TV room. It has to be a highly efficient workspace, since my mom and I will be sharing it when she comes to town. So, lots of storage boxes, labels and baskets. Still a work in progress but so far so good. Situation: storage closet under the basement stairs. Three doors (all access points for different appliances) but not a lot of room for storing boxes. So far, I haven’t used the space for anything other than the cans of paint that the previous owners left. (Sorry – didn’t think to take a photo of that gem.) A serious waste of space. Luckily, the shelves were the perfect width for the under-the-stairs nook, and we had the posts cut to fit according to the height at each level. All we had to do was assemble the shelves, add the wheels and roll them into the closet. Ta-da! They’re perfect. And did I mention 25% off? Thank you, annual shelving sale. Make that couch AND ottoman. Victory. Okay, so it was kind of a saga at IKEA last week. I’d been putting off the decision of what size couch to get … full-size sofa, loveseat or some sort of combo with a chaise lounge. And then there was the color decision. White? Light blue? Funky pattern with blue, white and green? I did get the exact ottoman I wanted, though. Dark brown leather with a removable cover for storage inside. Per.fect. Cozier. Comfier. Better view out the window. And – surprisingly – more room for additional furniture. Who would have thought? Now I just have to pick the paint color. Which will most assuredly take five times as long as moving the furniture around. Because isn’t that always the way it goes? I’m officially moved out of my family’s house in California. And for the first time in six years, all my worldly belongings are in one place. Amazing. And strange. Mostly amazing. This is me, packing the red glassware that mom gave me. Take a wild guess as to where it’s going. Here are my dad and brother (and Lissa peeking through the stairs) – they were moving my secretary desk from my bedroom upstairs to the trailer in the garage. Mom’s parents bought the desk as an antique when she was a girl, and Nana painted it green for a while in the 70s. Thankfully my grandpa stripped it back to the original wood in the early 80s, just before my parents moved from Minneapolis to San Antonio. This desk (as well as the Civil War bed and a number of other random things I’ve inherited) has now traveled a complete circle around the country: Minneapolis to San Antonio to Davis, CA and now back to Minneapolis, just a few miles from where my mom grew up. Scary? Just a little. The trailer, in the midst of packing. Then, leaving the California house for our cross-country road trip. So even though I’ve technically been on vacation the last two weeks (betcha couldn’t tell from my copious blogging, eh? 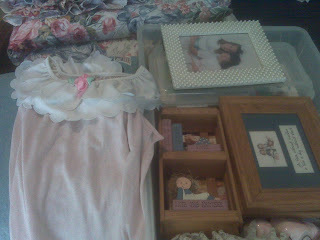 ), it’s been busy with packing, traveling, unpacking and working on house projects while I had my parents in town. My basement has become just as messy and full of boxes as it was when I first moved into the house in May – but this time, I know there are no more coming after them. They’re the last boxes. Those words sound so, so sweet to my ears. And my sore shoulders. Exhaustion aside, we made lots of progress over the last few days. I’ll be sharing photos and updates soon for the basement, office, living room and the yellow room. Meanwhile, I’m just enjoying being back at home. Minnesota and this house, both. Home sweet home.